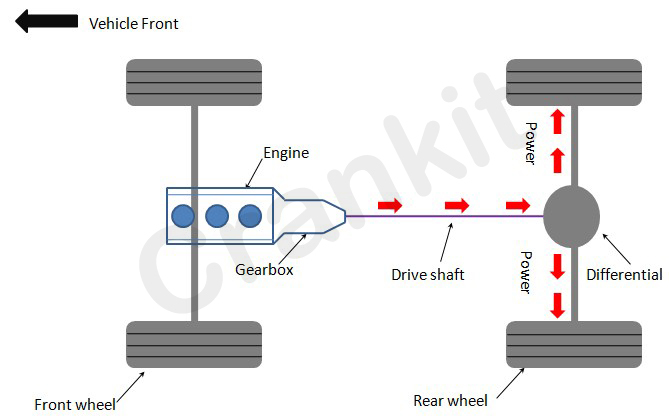 The rear wheel drive vehicle layout is a configuration in which the engine drives the rear wheels of the vehicle. For transferring the power generated to rear wheels, these vehicles use a number of components such as a drive shaft and a differential. The drive shaft is also known as a propeller shaft. Thus, power flows from the power-pack (i.e. engine and gearbox) to the propeller shaft and then to the differential and rear wheels. In comparison with the other vehicle drives such as the front wheel drive and four-wheel drive, this configuration is simple from design and packaging point of view. In addition, many engineers believe that RWD arrangement is more suitable for performance vehicles which employ engines of high power output. Among the above-mentioned arrangements, 'front mounted engine with rear-wheel drive' is the most popular in the automotive industry. There are two main reasons for this. Firstly, mounting the engine in front of the vehicle simplifies the layout by leaving ample space for other systems. Secondly, it helps to achieve better weight distribution (heavy engine at one end while other heavy components at another end) of the vehicle. During heavy acceleration when the weight of the vehicle is transferred to the rear axle, rear wheel drive vehicles provide better traction in contrast to FWD vehicles. Use of front mounted engine with RWD helps to achieve the better weight distribution of the vehicle. Because of the balanced weight distribution, the handling and braking of the vehicle improve. As the driveline components are located at the rear end of the vehicle, the engine gets an ample space for mounting. Thus, also enhancing access to it. Generally, these vehicles have a higher curb weight due to the use of heavy driveline components. Presence of the transmission tunnel reduces the interior space of such vehicles. RWD vehicles may lose traction while traveling on slippery roads like snow-covered roads. What is A Collapsible Steering Column & How It Works? What Are Adaptive Headlamps And How Effective They Are? What is kerb weight of a vehicle?